Re: Grim Gathering Questions? If they could get one book signed by one author, which and who would it be? Terry Pratchett - A man is not dead while his name is still spoken Apologies if this has been posted already, but inspired by Going Postal some tech-savvy Pratchetteers have created a GNU-code that can be added to most websites and even email, so as to keep Terry Pratchett's name forever 'clacking' around the internet. Re: Ancient and medieval fighting and weapons There's a huge number of weapons that fall under the category of "sword". Perhaps even more than all other premodern weapons combined. A complicating factor is that swords always evolved. Some people tried out making swords with somewhat longer blades or narrower blades, actually liked how it sat in the hand and moved, and recommended it to others. But there never was a perfect sword, because swordsmiths always had to take the availability and prices for raw materials into consideration, and more sophisticated constructions would take a lot longer, making the sword more expensive for the buyer. And always there were other people trying to improve armor against the types of weapons they were commonly facing against. As a result, it all blurs together into a very broad range of "swords", which is really anything with a long blade on a short handle. Of course in practice there were some forms of swords that worked really well and lots of people used them, while others just never caught on. So there are many different types of swords. But it never was an exact science and there was no standardization, so the distinctions between types are often quite blurry. Like literature genres, you have certain archetypes, but the personal preferences of the smiths and users don't conveniently stay within those lines. Modern historians like to pretend there are such clear lines, but many of the categories used today are modern inventions. That being said, the names used for swords in fantasy are almost always completely wrong. Mixing up an African leopard with a South American Jaguar is not a big deal, they are extremely similar. But calling either of those a Siberian Tiger is just plain wrong. Generally speaking, there are two types of swords: Bronze swords and steel swords. I am almost certain that you will never see a copper sword or an iron sword anywhere. Copper and iron are both too soft for large blades (though I think there are some copper knives) and you have to mix them with other elements into an alloy that has much better property. Copper alloys are usually called bronzes (brass is a modern term for a specific type of alloy that was lumped together with other bronzes in ancient times) and iron alloys are called steels, regardless of what those other elements are. You can make steel that is superior to bronze, but this is very advanced metalurgy that has been invented only in recent centuries. Ancient and medieval steel is not superior to bronze! The reason bronze fell out of favor for weapons and armor around 3,000 years ago is that tin, which was most commonly mixed with copper to make bronze, became fantastically expensive and almost unaffordable. This forced metalworkers to find some way to make a good alloy based on iron. Those early types of steel were inferior in quality to bronze, but still could do the job decently enough and were many times cheaper. Over time the quality of steel improved, but it really is the much cheaper price of steel that made it the primary metal of choice throughout late antiquity and the middle ages. When you have one guy with a bronze sword and one guy with a steel sword, it really doesn't make any difference. When you have five guys with bronze swords and twenty guys with steel swords, it makes a huge difference. Keep in mind that the "Middle Ages" refer to a period of 1,000 years and an area that includes all of Europe and extends into Northern Africa and Asia. There are lots of differences between specific places and times, so everything here is a very gross simplification. Scientifically very inaccurate, but I think for the purpose of fantasy weapons entirely sufficient. Unless you want to have a fantasy story set in real world France in the year 1241 and want to have it as historically accurate as possible. The most common one-handed sword that every halfway decent knight runs around with would have probably called by him a "sword". It wasn't like the swordsmith had a wide range of different models on a rack. You picked your length and weight that best suited your height and strength, but that was mostly it. 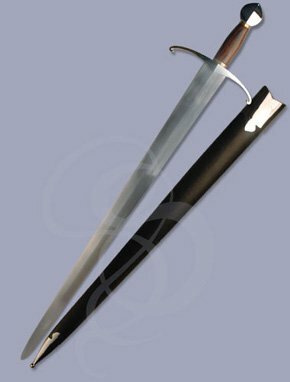 When people are talking about knights now, it's usually called an arming sword and looks like this. Which looks very similar to a viking sword, which lloks like this. The only real difference is a much smaller crossguard between the blade and the hilt. Not really sure why. The term Arming Sword is used mostly for swords that are later than the viking period so it might be possible that the crossguard was a new invention that came up around 1000 AD, but as I said those developments are always fluid evoultions that reach different places and different times and might not be adopted everywhere. This sword was not only used in Scandinavia, but I think throughout all of northern and central Europe. It is almost the same weapon as the earlier Roman spatha. Again, the handle is a bit different, but the blade is mostly the same. 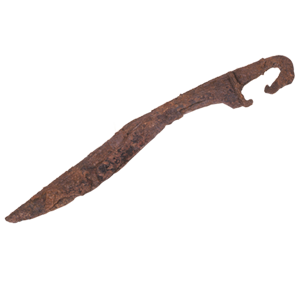 A straight steel blade about as long as an arm and two fingers wide. Even in China, at the opposite end of the Old World, you get the jian, which again is really pretty much the same thing. Why? Because it works! It's good. It's weight and proportions are a very good match for a human swordsman and it's a great alrounder that combines speed, accuracy, and versatility, while also being easy to carry around with you all day on your belt. Big downside: It's really expensive. Which is why most people who went to war didn't have one. Not only does the blade of a sword need five or six times as much metal as a spear blade, it also needs to be forged at a much higher quality because longer blades are at greater risk of bending or snapping. That's basic mechanical physics. Imagine taking a pencil and snapping it in two. That's easy. Now take one of those halves and snap it again. Which is a lot more difficult. And good luck snapping one of those quarters with your bare hands. And it's not because you have a bad grip on a small piece. Long things bend and snap easier than short things in relation to the thickness. Which is also why you get to see small blades very early, but really big and long swords only very late. You need a lot of metalurgical tricks to make steel that can take the stresses of such a large blade. When you fight a guy with really heavy armor, you want a weapon with a lot of punch, because your sword blade can't cut through it. When you do a cavalry charge, you don't want to get into the reach of your enemies spears to be able to hit them, so you also use a spear (a "lance" really is just a spear used while on a horse for most of history). Or a bow. The sword is wonderful when you don't have anything else. It's a great alrounder that will be useful in almost any situation. But when possible, you want a specialist weapon for your specific task. When you went into battle with one, it was your backup weapon, like a pistol. Even the samurai didn't make a big deal about their swordfighting skills, because that implied you somewhat regularly got into situations where you lost your bow and spear. Then why do modern Japanese people make such a huge deal about their swords? Because contrary to common belief, exotic foreigners are just as stupid as Europeans and Americans and love cool stuff they see in movies or read in unrealistic fantasy books. The lack of reach of a sword compared to a spear is a real problem in battle. Sparring is of course not the same thing as battle to the death, but people who are decent with swords and spears made the experience that if you have one person with a spear against one person with a sword, the swordsman needs to be extremely good to win. The only case I am aware of where regular soldiers were all using swords were the Roman legionaries. And that was because the legions used a very specific type of formation combat that relied on getting everyone squezed together so tightly that spears couldn't be really used and then stabbing swords were extremely effective. But that is really the only case I know of large numbers of soldiers using swords instead of spears. Speaking of the Roman sword: I mentioned the spatha earlier, but the standard roman sword was the gladius. Which also really just means "sword". The gladius is shorter than the spatha, but not really by much and calling it a "short sword" is quite misleading. They are still pretty big. I mentioned before that large blades require advanced metalurgy and forging techniques, and therefore most bronze swords tend to fall into this category. In the same way daggers can be really big too. Much larger than a small pocket knife. The roman pugio looks like a big knife (though technically a knife has a single edge, while a dagger has two), but some types are large enough that some people might think of them as small swords. The other type of sword that is super popular around the sword are sabers. There is a huge variety of sabres, both in blades and handles, but they all share the same trait of having a single edge and being curved. Sabers have some advantages and disadvantages compared to straight swords. The disadvantage is that they are generally not as good at chopping, but instead work much better at slicing. Which is why soldiers on horses generally tend to favor sabres over straight swords because when you ride by someone on the ground quickly, it's easier to just slice your blade over him than trying to get a good chop from an akward position. But when you hit armor, a sabre has less of an impact and doesn't hurt as much. Neither sabres nor straight swords can cut through metal armor, but any heavy impact still hurts and can push you over. Then you have a couple of "hybrids" like the German messer ("knife") and the Japanese katana ("sword"). While they do have a single edge and a slight curve, the curve is quite subtle and the blade pretty heavy. You see katanas everywhere, but I don't remember seeing a messer anywhere in fantasy, even though there's no reason why it shouldn't. Going back to antiquity, there is also a kind of chopping sword that looks really quite weird at first. Again, there are many names, but the most generic is kopis. And the title for weirdest looking sword probably goes to the Egyptian khopesh. Swords like these are almost a kind of hybrid between sword and axe and saber. You can't do any fancy fencing with them as you see in a three musketeer movie, but you can both chop and stab with them. And you really just have to look at them to see how extremely good these are at chopping. While they look very exotic, this was one of they ypes of swords used by the Greeks for quite a long time. But they went out of fashion during Aniquity, and I don't really know why. I would suspect that a straight sword is simply easier to forge, though. You also might know the Asian kukri, which really is just the local adaptation of the kopis introduced by Alexander the Great when he was in the region. Most kukris you see are small and knife sized, but they can get to the size of big two-handed swords. It was well worth the 380 mile round trip! Met lots of lovely people who all made me very welcome (I had been a little apprehensive, coming alone) The panel was interesting and fun, the pub was even more interesting and lots more fun! And now look at me, in my first ever forum! I particularly enjoyed the chance to chat with the authors and indeed the other Gatherers at the pub, numerous questions came to me, drink in hand, that I'd not thought of earlier! I made lots of new friends and probably quadrupled my to read pile. Interesting topic. I wont add anything about weapons (later I might write a few lines about archery, although I know basic stuff, but learned them from a real master), just want to remind you on something: more writing, less exploring and world building. Please do post regarding plinking arrows. I wish I could write. Sadly I have a head full of ideas some knowledge and the ability to produce a training manual if I try and write fiction. Heard a bit of the Vagrant a couple of weeks ago at SRFC and seems like its going to get a lot of buzz on these forums. The cover is so striking, I wonder how much that is supporting/driving the buzz? A big part of the 'pre-release' buzz is the fact that it is Voyager who are publishing it. What I've come to notice is that when Voyager pick up an author they tend to do so because they are fairly certain he/she is going to do well or at least that their marketing team can ensure they put all their effort into making sure they do. I presume this is because with authors like George R.R. Martin, Robin Hobb, David Eddings, Janny Wurts and Raymond Feist on their lists they don't want to water themselves down. In fact, I think the last Harper Voyager Epic Fantasy debut was Mark Lawrence (2011)? Gollancz, in contrast, had 6 debuts last year. And, as Dom says, the book is very good and does draw you into it quite quickly - the mystery of it means it is very hard to put down until you relieve yourself of the burden of confusion. I was at the SRFC too! Dead pleased to hear all the good buzz about The Vagrant - Pete is a top chap! Ursula K. Le Guin - Radio Dramas and Documentaries for UK people There is currently an ongoing series of programmes on BBC Radio Four in the UK celebrating Ursula K. Le Guin's 85 years. These include a 2 part The Left Hand of Darkness drama, a 6 part Earthsea drama and a lengthy documentary and discussion on and about Le Guin's 85 years. Science fiction with incredible humanity from a brilliant feminist writer. This is the first dramatisation of Ursula Le Guin's 1969 novel which is as groundbreaking in its approach to gender as when it was first published over 45 years ago. In a snow-changed city in the middle of an Ice Age on an alien world, one young man prepares for the biggest mission of his life. Alone and unarmed, Genly Ai has been sent from Earth to persuade the world of Gethen to join The Ekumen, a union of planets. But it's a task fraught with danger. Genly is shocking to the natives. This is a world in which humans are ambigendered - everyone can be a mother, and everyone can be a father. First Minister Estraven is the only person who champions Genly's cause, but their relationship is deeply incomprehensible and troubling. Genly's life is at risk and he must decide who to trust. Naomi Alderman talks to leading novelist Ursula Le Guin about her life and work and hears from literary fans including David Mitchell and Neil Gaiman. A tale of wizards, dragons and magic by Ursula Le Guin. Obviously these are all only available here in the UK.